From LGFA website The Ladies Gaelic Football Association today announced an exciting new partnership with the Irish Cancer Society. The two associations will combine to set the World Record for ‘Most people wearing Bandanas’ at the 40th Ladies Football All Ireland Finals in Croke Park on September 29th. The pink bandanas will be on sale at Croke Park on All Ireland Final day, from the Croke Park Hotel and other outlets along with being available from the LGFA offices from September 16th, the specially designed bandanas will be pink in colour. All proceeds from the sale of the bandanas will go directly to the Irish Cancer Society’s Action Breast Cancer programme. The record will be set at half time of the TG4 Senior All Ireland Final and every ladies football fan from every part of the country is being urged to come to Croke Park to help support a great cause whilst having some brilliant fun and enjoying top class ladies football action. There is no family in the country that has not been affected by cancer and breast cancer is the second most common cancer in the country with over 2,500 women being diagnosed with the disease every year. 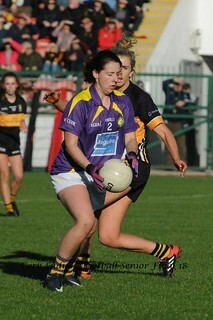 Research has shown that the risks of cancer can be reduced drastically through simple lifestyle changes including becoming physically active and maintaining a healthy weight, these are two factors that can be positively affected by taking part in ladies gaelic football which caters for women of all ages and abilities. Speaking at the announcement of the new partnership between the LGFA and the Irish Cancer Society, LGFA President Pat Quill said ‘We are extremely happy to announce our new partnership with the Irish Cancer Society. This will form a major part of our 40th All Ireland Final celebrations and will add a huge amount of colour and extra atmosphere to an already fantastic occasion. The work the Irish Cancer Society do is amazing and we are delighted that we will be able to help out in some small way through helping drive awareness as well as contributing all profits raised from the sales of bandanas directly to help them continue their great work.’ “We’re delighted to be the chosen charity for the Ladies Gaelic Football Association this year,” said John McCormack, Chief Executive Officer, Irish Cancer Society. “One of our key goals for 2013, as we celebrate our 50th birthday, is to begin to implement our new strategy – A future without cancer. It is great to have the support of the LGFA, especially in their 40th year. We now know that positive lifestyle choices can hugely reduce someone’s risk of cancer so it is great to be associated with an organisation that does so much to promote sport in Ireland – in young people in particular. Being active in sport from a young age is a great thing to do for your health. We look forward to working with the LGFA over the next year.” The Irish Cancer Society is the leading provider of cancer information, advice and support on all aspects of breast cancer as well as being the leading funder of breast cancer research. 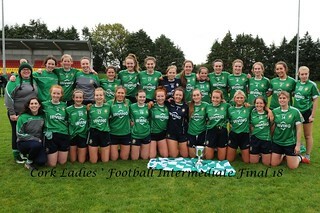 Tickets for the TG4 Ladies All Ireland Football Finals will be on sale via the Ladies Football Offices who can be contacted at 01 836 3156 or through info@ladiesgaelic.ie. ENDS About the Irish Cancer Society The Irish Cancer Society is Ireland’s national cancer charity. Established in 1963, 2013 is our 50th year. The Irish Cancer Society provides information, support and care to those with, and affected by, cancer all over Ireland. Our services are professional, confidential and free of charge. We are almost entirely funded through the generosity of the public and receive less than 5% government funding. Towards a future without cancer The Irish Cancer Society launched their new five year strategy earlier this year entitled – A Future without Cancer, which is the Society’s vision. The mission of this new strategy is to eliminate cancer, with four key goals to achieve this; Goal One: Reduce the risk of cancer; Goal Two: Improve lives; Goal Three: Lead excellent collaborative research; Goal Four: Inform and influence public policy. Cancer in Ireland Ireland’s cancer rate is one of the highest in the world. One in three of us will be diagnosed with cancer during our life time and it is estimated that by 2020, 43,000 new cases will be diagnosed. Latest data from the National Cancer Registry (NCRI) shows that nearly 33,741 people were diagnosed with cancer in Ireland in 2010. These stark figures mean that there is an ever increasing demand for the services provided by the Irish Cancer Society.